GALION — Businesses in Galion will be participating in a nationwide retail event on Saturday, Nov. 25. Small Business Saturday was started in 2010 as a way to help small town businesses that were hurting due to the economic recession hitting hard across the United States. It has been scheduled and organized around the Saturday after Thanksgiving as a way to kick off holiday shopping for local communities. In just six years time, the event had caught momentum in all 50 states and was supported by more than 100 corporations. While Galion has participated for a few years now, this year we have the distinction of being named a Neighborhood Champion, which requires them to abide by some simple rules, but also gives the Galion-Crestline Area of Chamber of Commerce some tools to help they publicize Small Business Saturday. Numerous Galion business are involved in the event this year. Participants are offering at least one item from their location for sale at a value price of $10, but will only have a quantity of 10 of each of them for sale. Some of the items being offered include an Ohio State coffee mug at the Evergreen Company, a set of cookie sheets from Poland True Value Hardware, or Christmas ornaments from Quay Drugs. 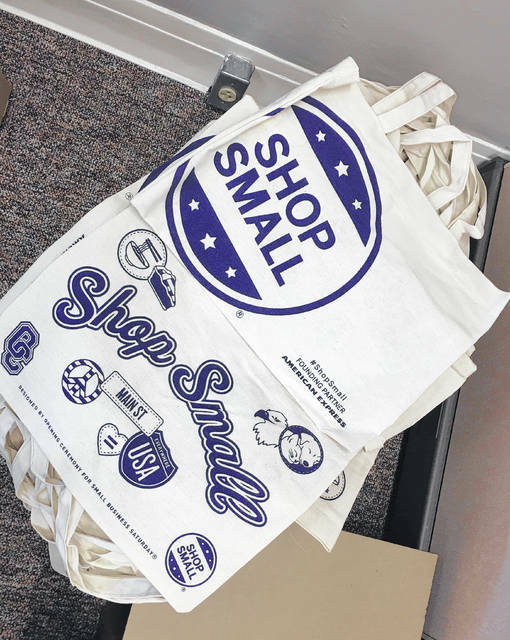 Each business will have special “Small Business Saturday” shopping bags to pass out at no charge to shoppers while supplies last as they come in. Shoppers will also be given a paper “Passport” with a listing of all participating businesses that day. Each time a purchase is made from one of the businesses on the passport, the business will mark the paper accordingly. If ten purchases are made, shoppers are rewarded by getting a coupon book that will be good for the month of December at Galion businesses. Qualifying passports must be turned into the Galion-Crestline Chamber of Commerce by the following Monday, November 27. Chamber Member Engagement Director Miranda Jones has worked hard to make this a success for Galion businesses and shoppers. “You could shop for your family here, and keep the money in our local economy,” she said. The coupon book is a local incentive that Jones came up with to continue the momentum from Small Business Saturday for Galion businesses. “We want to give people a reason to return to Galion stores for their holiday needs during the season,” Jones stated. Galion-Crestline Area Chambers of Commerce is preparing for Small Business Saturday on November 25. Multiple Galion businesses are participating with special offers for shoppers that day only for $10 to kick off the holiday shopping season. https://www.galioninquirer.com/wp-content/uploads/sites/38/2017/11/web1_23715215_10212408913036234_585585619_o.jpgGalion-Crestline Area Chambers of Commerce is preparing for Small Business Saturday on November 25. Multiple Galion businesses are participating with special offers for shoppers that day only for $10 to kick off the holiday shopping season.